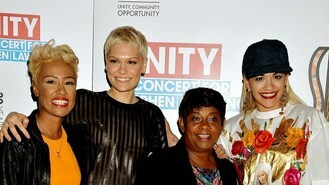 Unity - A Concert for Stephen Lawrence was also due to feature performances from Rizzle Kicks and Jamie Cullum. Stephen's mother Doreen, who accepted a peerage this year for her tireless campaigning, said her son would be "smiling down" on the show this evening. "He would have loved this because he really loved music," she said. "I would like Stephen to be remembered as a young man who had a future. "He was well loved, and had he been given the chance to survive maybe he would have been the one to bridge the gap between black and white because he didn't distinguish between black or white. He saw people as people." Tonight's concert was designed to unite communities and draw people of all backgrounds together through music. It saw artists select tracks chosen for their social message.